Il Best Western Canton Inn è situato nel centro di Canton. L'hotel è vicino alle principali attrazioni turistiche. Approfittate tutto l'anno del miglior prezzo garantito e di offerte esclusive. Fermati in questo hotel di Canton, Mississippi, e goditi le nostre comode camere e il facile accesso alle attrazioni del luogo. Il BEST WESTERN Canton Innè situato in una posizione comoda per raggiungere agevolmente le maggiori attrazioni e le principali aziende locali, fra cui lo stabilimento della Nissan. L'aeroporto internazionale Jackson si trova ad appena 32 chilometri circa di distanzaOgni mattina viene offerta una colazione completa gratuita agli ospiti dell'hotel. Gli ospiti di questo hotel di Canton possono approfittare inoltre di una piscina all'aperto. Le camere arredate con gusto dispongono di accesso gratuito a Internet ad alta velocità, televisione via cavo/satellite con HBO, articoli da toeletta, ferro e asse da stiro, bollitore per tè/caffè e asciugacapelli. Il nostro personale cordiale assicurerà ad ogni cliente un soggiorno comodo ed indimenticabile. Prenota online oggi stesso e risparmia in questo hotel di Canton, Mississippi!Ti auguriamo un soggiorno gradevole! Loved the rooms very nice and clean and staff was very friendly. I did not like the breakfast. They had a pancake machine and was not tasty. I was served the same breakfast two mornings in a row. No lids for the coffee and no fruit. Other than that loved the rooms. room had been remodeled nicely but the carpet was dirty. Breakfast was ok, not real impressed with it. Night clerk was very friendly and the price was right. The location was abt 20 miles south of Jackson so it made in and out easy. this hotel was in a row with about 20 other hotels. "Room Smelled and Bad Beds"
Booked the hotel for one night stay on our way to Tenn. We arrived late in the evening and checked in. As soon as we start walking to our room down the hall on the 1st floor you could smell the cigarette smoke. The smell got stronger the closer we got to our room. We found a room door open that the smell was coming from. Well our room was right next to it so our room smelled. The bed was very uncomfortable and the breakfast was not much to talk about. The staff was friendly & very professional. We were checked in in a short amount of time. Check out, we had to hit the buzzer for help but once she arrived she was very helpful. The room was very nice. Unfortunately, we didn't try the breakfast. They had a nice fitness room. Very nice place, great people, really enjoyed our stay. Lady at front desk was awesome, rooms were clean, everything worked, and breakfast was plentiful and there were many options. Easy checkout also. 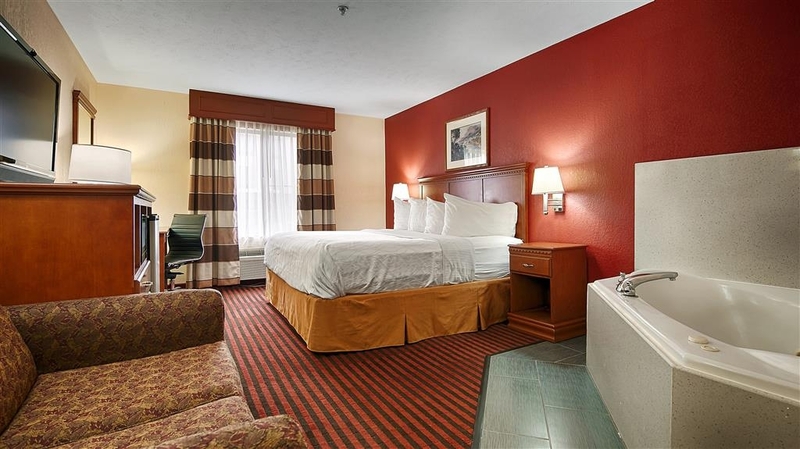 "Great location and good staff"
We were in rooms 105 & 120 (last room on 1st floor). After checking in, within an hour it smelled like someone was smoking meth or flavored POT all in the hall. Smell drifted into rooms also. We asked for both rooms NON smoking, #120 reaped of smoke and had ash trays in it. We inquired and they said they leave ash trays in all rooms, but #120 was a non smoking room. NOT!!! Thank goodness I had purchased a candle earlier in the day. They said they were booked and could not change the room. OK, but should not have booked a nonsmoking if they didn't have one available. Furniture in #120 was falling apart. #105 was just 'ok'. Breakfast was 3rd class. Eggs appeared to be pancakes, the sausage and gravy too bad to eat. Thank goodness for cereal, milk and yogurt. Also sounded like people on 2nd floor did a jig all night long. My stay at this Best Western was relaxing. The staff was very personable and knowledgeable, always going the extra mile. The complementary breakfast was good. Extremely clean rooms. Super fast WiFi internet. "Nice Hotel in Canton, MS"
Very clean and well kept hotel. Breakfast was exceptional. 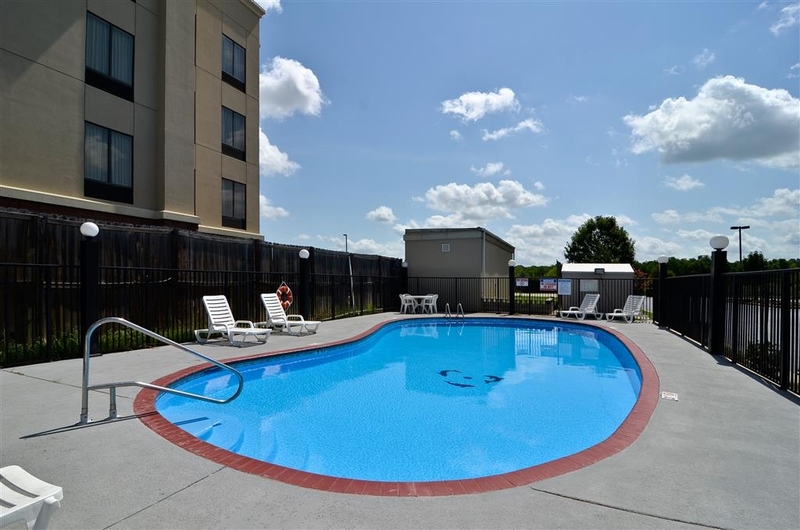 Outdoor pool open only in season. Located right off I-55 interstate. Internet was super fast! Staff was very pleasant and helpful. We would stay here again. I was absolutely shocked at the experience I had at this hotel. -Old air conditioners piled up in the hallways. -No food at breakfast every one of the 4 mornings we were there. Bread and pastries had bugs flying in and around them. Pancake machine not working. Hot food dishes empty. -Hotel's printer not working. -Guests with small children allowed to run the halls yelling and screaming at all hours of the night. It was simply a nightmare. Only good thing I can say is that the bed was comfortable. We stayed here for three nights while turkey hunting in the area. The staff was very friendly and accommodating. Breakfast was even served a bit early for us. The hotel and rooms were updated and very clean. We would definitely stay there again. I stay there often being it's pet friendly and usually have a wonderful experience. This time I woke up and had red bites all over me. It was bed bugs. I had to check out a day early and was still charged $187 for two nights. BEWARE people and check your bed sheets first! We went to Canton to see the Christmas lights in the old town square. Such a delightful place out of a old picture book In May and October they have a fabulous craft show where there are about 200 vendors. The entire town helps and several homes open their homes for test spots and bathroom facilities. Wonderful small town America. The hotel was a great value. I wish I knew the girl's name that checked us in, she was so friendly & helpful! She recommended restaurant down the street that was amazing! Just an awesome stay, would definitely stay there again. 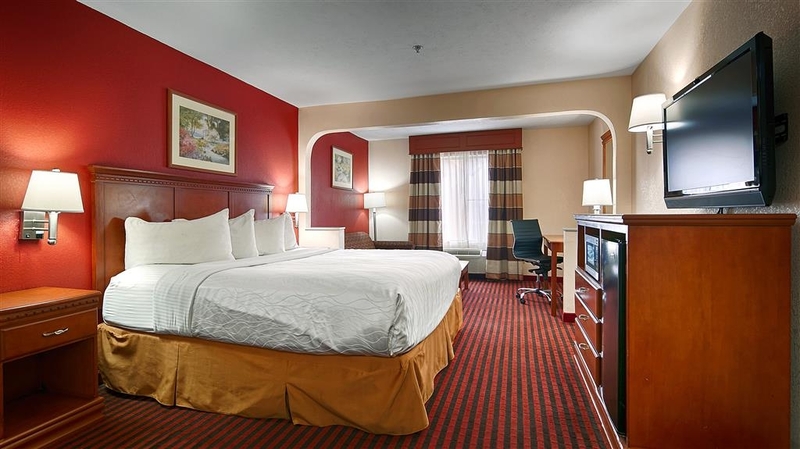 This hotel is conveniently located near the interstate, easy off, easy on, near places to eat and city center. We have stayed here on a recurring basis because it is close to family and events that we like to attend. The whole place smelled of smoke..the sink was plugged and plug was off it..the bedding was all stained!! The towels were stained and had holes in them..this is totally unexceptable!! and i have pictures of everything! I would like my hard earned points back!! This Best Western Is not maintained. The sink in the bathroom did not drain and was disgusting. The carpet felt damp , maybe due to air conditioner which was a wall unit and very noisy. there is not an elevator so ask for the first floor if you do not want to carry luggage up stairs. Breakfast was absolutely terrible. I was pleased with this hotel. The desk clerk let us check in early and was helpful and very polite. The room was clean and nice. The bed was great very comfortable and clean. The breakfast was somewhat limited but was hot and what they had was good. Staff was really friendly and glad to help in any way they could. I will be staying here again when I'm in the area. "REVIEW OF BEST WESTERN IN CANTON, MS, USA"
Very Disappointed . Room was just OK, No amenities besides TV, FRIG, Microwave. Breakfast was just OK. Porrly presented. Lack of variety of healthy items. Interior of motel looks dirty and poorly kept, even if it isn't. Lack of area eateries. One Mexican restaurant within walking distance - it was terrible, left half of my food. Overall - won't stay there again! Room available without advance booking and was nice and comfortable. Appreciated the breakfast. It was quite tasty and convenient. That is one of the deciding factors when looking for a place to stay away from home. The staff was the best. The breakfast was also very fresh. The room was clean and very fresh. I never go wrong when I stay at a Best Western. the access was easy to get to as well. I will stay again if ever in the area. Awesome venues a must see nice place to stay!!!! There is lots to do in canton and surrounding areas the street market 2 times a year the entire town shuts down streets are full of venders and food !! This hotel is a recommendation for this trip!!! My stay was okay. Will I stay again not sure. Room not as clean as it needed to be. Hair in tub mirror dirty. You could also smell smoke. Would rather floors separate from smoking rooms. Looking for a new place to stay for the next trip. Ive stayed here maybe 100 nights over the last few years. Always a good experience. Good price. Very good room. Helpful staff that always remembers me and my room requirements. Have had many of my co-workers stay here. "Did not honor quoted/check in price!" The worst Best Western I have ever stayed in. Check in was ok, friendly staff. I Was quoted $72.00 plus tax rate but upon check out I was charged $81.50 plus tax. This hotel is run down, ugly decor that must be twenty years old. I stayed in room 103 and it smelled very bad. At the front desk on the right side there is a hall way stacked up waste high in boxes and junk. Pit that crap somewhere else, how about a closet. The flower beds are devoid of mulch and the bushed needs trimming. The grass needed cut about a month ago, almost ready to cut for hay now. The entrance to the hotel is terrible shape. Lights broken off. I will call manager tomorrow about the rate change. I will not stay at this Best Western again. Stay somewhere else. Manager sends me their usual letter thanking my for my review but not mention of the over charge. I have reported him to the Corp office. DO NOT STAY HERE! I would like to thank you for taking the time to help us identify unsatisfactory points of our experience with us so that we can continue our pursuit of providing the perfect stay for all of our guests. Unfortunately we were unable to provide a satisfactory experience to this guest much less exceed expectations as we are accustomed to. We look forward to improving our operations so that we can better serve our guests. We got to the hotel at about 9:30pm and the welcome and check in was quick and pleasant. The room was very clean and we also got a free breakfast all for a great price. Will stay here again if we are in the area. Clean, classy, great decor, and wonderful service...almost as good as tye high-end, Las Vegas motel we stayed in, for our son's wedding. Homemade cookies greet travelers at the front door, the price was reasonable, and many restaurants are within walking distance. If we ever drive through Canton again (and we probably will), we'll stay here, again. Definitely, thumbs up! Very nice hotel and excellent service! Room was clean and employees were very helpful! Fast and friendly check in as well as checkout! Hotel was easily accessible from interstate. Would recommend to everyone! Breakfast time to early(5-9). It should be 6-10. Inventory of the was basically none existence at 8:20 am. I was disappointed. All guests cannot drink while or 2% milk. Low or fat free should be an option. Towels was dingy and limited. Guests like sports, had limited channels. We stopped here on our way to NOLA. Because we are traveling from St. Louis and didn't know how far we would get, we didn't make reservations anywhere, just deciding to take our chances wherever we landed. One of our party called ahead to another hotel, but they didn't have the four rooms we needed for our whole group. This was the second place we contacted and found they could accommodate us. My roommate for the trip and I were given keys to our room and we went up, discovering when we arrived that we hadn't been asked anything other than 'smoking' or 'nonsmoking'. Whoops! King bed. We went back down and swapped for two queen beds. No problem. Our new room was better in that respect but I must say that the bathroom had not been thoroughly cleaned and I wound up cleaning it a bit before I could use it. ?? Still, the rest of the room was in good condition and the staff was friendly. They need to pay better attention to sanitizing the bathroom but that's my only concern for this place. It's located near the highway, which is audible from the rooms facing it but it wasn't bad. We stayed at this Best Western on our way to New Orleans. It was a nice hotel for the price. I've always had good experiences with Best Western hotels. The complimentary breakfast was just okay, but it was free so I can't complain too much. I would definitely stay here again. "Better than the last time, but..."
My stay last night was better than the one in May. My room was of good size with a nice and comfortable bed and pillows, large TV and nice desk area. The HVAC worked very well by wall thermostat and offered the "fan on" option that I like for white noise while sleeping. The bath was overall in good repair although the was a previous guest's soap in the shower, little toilet paper on the roll with no backup (could be the first time in all of my years traveling that I've seen that) and only one small bar of unused soap. The shower gel dispenser in the shower, next to the shampoo/conditioner one, was also empty. Like my previous visit, this location mainly suffers from someone paying attention to detail. The included breakfast included all of the same, pedestrian fare that I've become somewhat tired of in my travels. I was also disappointed that there were no lids that fit the BW provided coffee cups. Imagine driving down the road with your coffee sloshing around in the cup holder. Really, no lids? At checkout, the front desk person and possible co-owner of the hotel was outside pruning the bushes by hand. A good thing to do, but not when there's no one left to attend to the desk for checkouts. Plus the Chinese to alert them that someone's at the desk can't be heard outside. Oops... Overall I'd recommend this location and encourage them to strive for the next level as they're almost there. I was pleasantly surprised with this hotel. My room was clean and the bed was comfortable. The only problem I had was someone in the room next to mine was blasting their tv at 3:50 in the morning. I called the front desk to complain and the clerk came up and told them to cut the noise. The breakfast was ok. I would stay there again. 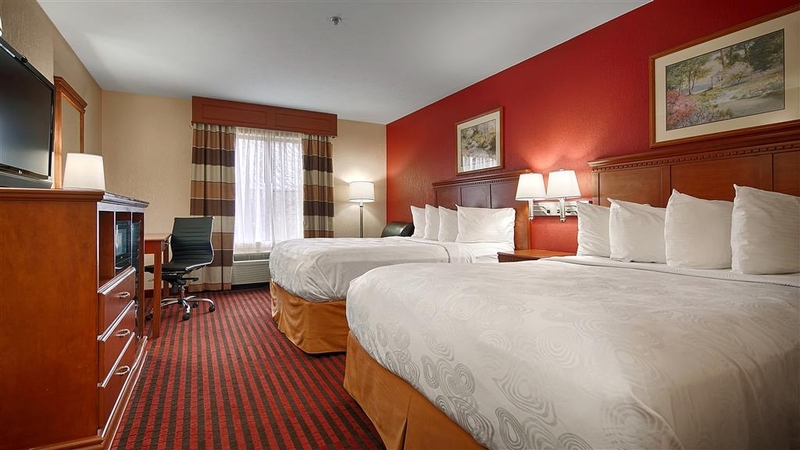 "Great comfortable bed, clean and a good rate for the value"
The room was clean! I'm a clean freak so I always look in the corners, make sure the room has been dusted and cleaned of hair and the small stuff makes a difference. The room was very nice and more than what I had expected in all honesty. My only real complaint might have been the noise in the early morning since I was a room near the stairwell and I came down for breakfast about 6:30 and all the food was already gone and I'm sure they brought out more later but at the time I couldn't wait. Got in and found that the booking was a day off. Clerk immediately told me it was not a problem, she had a room and could take care of reservation error. Very pleasant to deal with. She actually gave me a room that was a step up from what I'd needed for the same price since I was only going to be there one night. I stayed at this property for one night along with two other people on business. This indoor corridor hotel had a good reputation from prior reviews so I selected it. Check-in had at least two issues, one in which we found out the hotel did not have an elevator to the second floor and our room type (two queen with rollaway, non-smoking) was only available on the second floor that evening. We were up-charged $10 for the rollaway for the third person, and accepted the reservation only as it was late on a Saturday night and the probability of getting another room was questionable. After hauling our luggage to the second floor via stairs, our original room was unable to be unlocked due to equipment malfunction (yes, back to the desk for new keys!) and we were assigned another room. Just a note on the lack of an elevator, we inquired as to why there was not one on property. We were told by hotel staff that the cost to install an elevator was in excess of $35K and the owner did not want to spend the money. 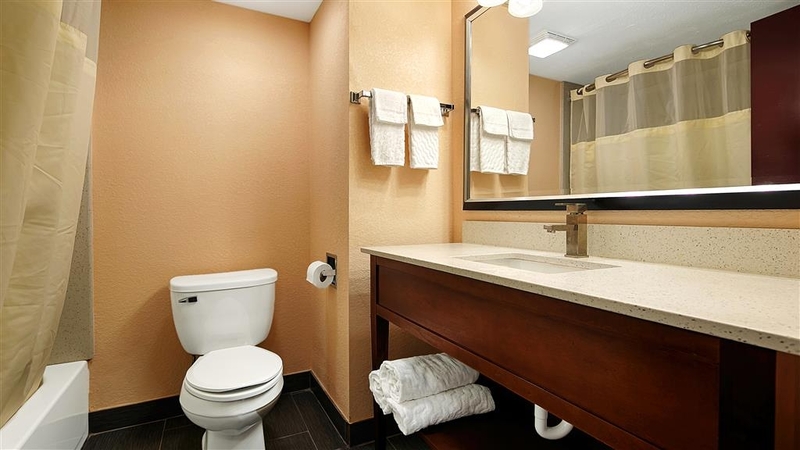 Absolutely not annotated anywhere on Best Western's website - you assume the property has an elevator as they tout their ADA conveniences and it's an indoor corridor hotel. More on that in a minute. The room had a predominant foul order upon opening the door that we went nose blind to after a few minutes. Inspection revealed several problems with the room including other peoples hair in the tub, a stained and discolored shower curtain, white residue of unknown nature on the bathroom steel mirror trim, and a absolutely filthy overhead vent. Someone had left an adhesive price tag adhered to the tub surround, this was completely visible with even a two-second cursory inspection. The AC cooled minimally but it was enough for the night. The mattresses were fairly comfortable and the carpet only had minor stains. In the morning, upon taking morning shower the hot water was of good quantity and temperature, however there was no shower gel in the dispenser (these properties have gone to liquid products dispensed in the tub as opposed to little bottles of shampoo and bars of bath soap). Tried to call the front desk to see if the dispenser could be filled. No answer. Very disappointing. Just a water wash was the order of the day unfortunately. After the wash the outer layer of my skin was ablated away by the sandpaper-hard towels, so I guess it really didn't make a difference. After going downstairs in the morning, I found that the buffet was not well attended to by staff as plated and unclaimed food was laying on the counters. This was there for the entire 20 minutes I was eating. The variety of items was OK, but no yogurt or similar. Sausage and pre-formed egg patties was the breakfast of the day. I spoke to the desk clerk following breakfast, showed pictures, and expressed my dissatisfaction with the stay and inquired as to a manager. I was told no manager was on property. Neither was the executive housekeeper. One other item. The hotel services listing in the room lists the fact that "The entire hotel is handicap accessible". Wellllll.... last time I checked without an elevator, a person with a mobility disability or wheelchair-bound couldn't levitate to the second floor. This means even though ADA improvements such as wider doors are applied to the second floor, you can't get the people up there to use the amenities unless they are carried. This is a completely incorrect statement made in writing by the hotel management. The guide in the rooms needs to be re-written. All in all, this was not a memorable stay. Poor quality control on the room cleaning followed by incompetent inspection of rooms by the executive housekeeper - our room should have never been released for occupancy. The only redeeming qualities of this property were that the hot water was good and the mattress was comfortable. I'm being generous by giving this property an overall "POOR" rating. When I entered the hotel, I was a little cautious because it seemed I smelled smoke in the lobby. The evening desk clerk offered me the opportunity to see a room. I went in and it smelled better than the lobby. I did not have a reservation, but she gave me a good rate on a Friday night. I'm a member of Best Western Rewards, but did not have my card with me. She gave me some disinfectant spray to freshen up the room. I woke up at 5:45 am and went to the breakfast area. It was already prepared and very tasty. Everything in the room was clean and the bed was very comfortable. The hotel had a recent remodel and upgrade and I think that is what accounted for the odor in the hall and lobby. Individual room A/C made my room very comfortable. Very good iron & ironing board. This hotel is an exceptional value hotel with the best supportive clerk. They strive to ensure your special needs are met. The hotel is located right of the interstate on hotel row. The employees are friendly and helpful. Overall a great hotel to stay in. Staff was professional, Courteous very informed and willing to go above and beyond to meet the needs of customers. Rooms were clean and well kept, plenty of extra towels, free news papers, good food, and great service. The hotel overall was very nice, recently renovated. The bed was very comfortable for the wary travelers my husband and I were. They allow dogs, which is a plus because we have two of them. The hotel does not have an elevator which seems strange, but not a big deal to me. The exterior of the building was brightly lit with blue neon lights, which is apparently part of the new Best Western branding. A Nissan parking lot located adjacent to the hotel had VERY bright lights ALL night long, which was a tad annoying, but beyond the hotels control. Came into town for a business trip. The hotel was clean. Breakfast was good. The girl who checked us out at 4:30am was awesome(Laporse I believe). The girl checking us in could not have cared less about us. The hotel overall served its purpose of a good night sleep for a reasonable price. I stayed here one night on business and was so relieved to get out the next morning. I'm a clean freak and it was not up to par. I did't see anything disgusting or stained but there was lots of dust and it was dingy. The safety lock on the room door was broke so I wedged the coffee table there to make sure no one came in during the night as I am a woman and was traveling alone. The breakfast was very limited and I just got a yogurt and danish. I'm not slamming this place it was okay but I don't plan to visit here again. This hotel is cheap. Once I entered the room I noticed how loud the air conditioner was. It's very loud. There was one square of soap in the bathroom for a family of four. No lotion. Tape was wrapped around the door and the peep hole. However the room was clean and the beds were soft and somewhat comfortable. The breakfast was decent, pancakes and sausage was pretty good. For a one night stay it's okay , expect no perks! I can wholeheartedly recommend this Best Western hotel. The room was freshly redecorated and very tasteful at that. Checking in was painless (6/18/2016). The young lady was very pleasant and made my wife and I feel very welcome. 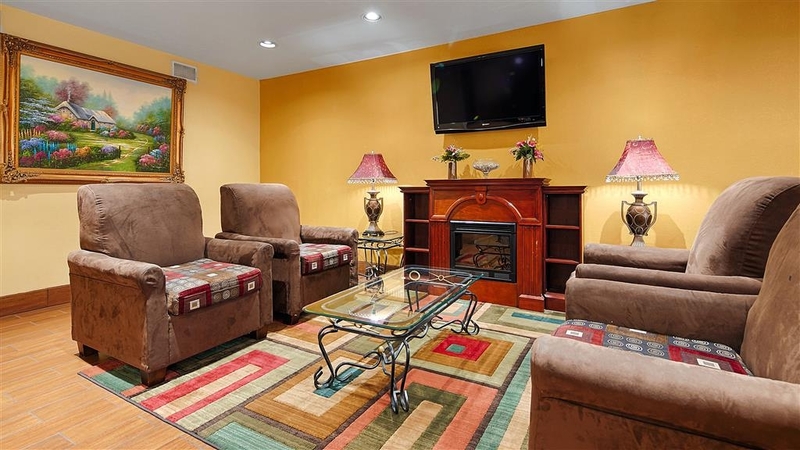 "Good value/stay, a few details to attend to.."
Good all around and comfortable stay. Really a good value at about $80. The maintenance and clean staff could look a little closer for items that need addressed like the bent up window screen and the areas in and around the night stands that could use better vacuuming. The worst things about my room/stay were the filthy air filters on the HVAC system that I pulled and left against the wall and the mildew ridden shower curtain and liner (see photo). I even removed the liner and left it in the tub, such is when I took the photo. Inexcusable and rather gross even for a guy. I left friendly notes, as I usually do, for the maintenance and cleaning staffs so that they will hopefully address the issues before management asks them to after they read this. All in all, due to the value and my overall thoughts on my stay, I would use this hotel again, but only after I check the shower curtain and liner first. If I can see these concerns, so can the staff and management. A little polish and this would rate as a very good place to stay. "BEST PRICE AND HOTEL IN CANTON"
This hotel was very clean and the beds were soooo comfortable. The absolute best hotel shower I ever used. The lady at the front desk was very helpful and knowledgeable. She solved a small problem with the tv (it was unplugged) and the restaurant recommendation was great. Great experience. Clean modern rooms. Nice plesant staff. Complimentary breakfast was very good even had an automatic pancake maker! Only issue was how loud the air conditioner was comma but that was so nice fell asleep anyway pretty easily. Highly recommend. Needed a place to stay in the area picked low price and rating on trip advisor and was not disappointed . 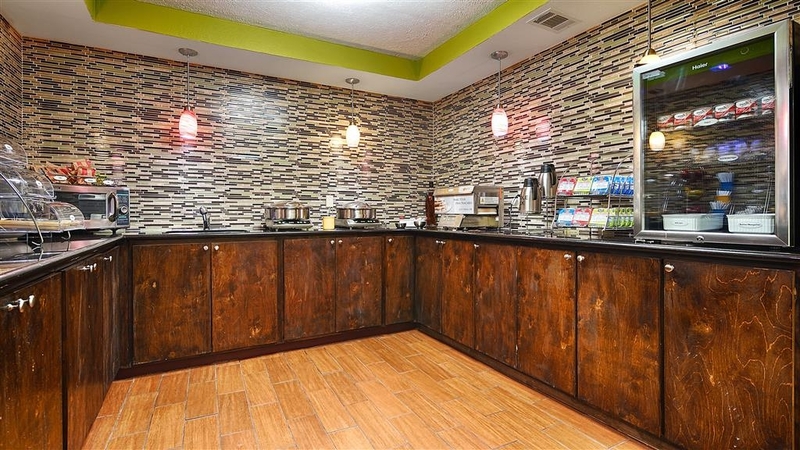 Although it looked like they were in the process of remodeling with construction material stacked in couple places in the hall the room was clean staff nice and the breakfast was ok and the price was ok about $70 . Thank you for completing a Trip Advisor review for us! Your review was very nice, and it seems that you enjoyed your experience! We look forward to your return visit to Canton, MS, and specifically our location. This Hotel was clean and the bed was very comfort . 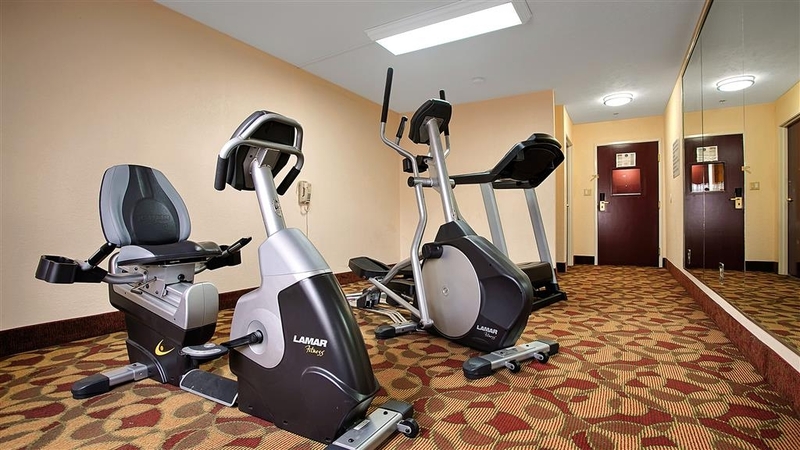 The room has Directv that keep you and your family entertain . It has more channels than any other Hotel that I been in . It easy to get to the express so you can go to shops.. Thank you for taking the time to review our hotel on Trip Advisor. Everything seemed to have been satisfactory during your stay...wonderful! Please come again. We were very pleased with this Best Western. Even though it was right off the interstate you did not hear the traffic. The room was nice, clean and updated and the bed very comfortable. We would stay here again. The price was right, Staff was very friendly and helpful!! There is a good mexican restaurant in walking distance. My staff loves to hear the great job they are doing! Thank you for posting, and we appreciate you as our guest. We look forward to your next visit here with us! "Lots of fake favorable reviews- beware!" Old motel, lots of smokers including our "nonsmoking" room. See photos- dust and dirt, lumpy mattress, dingy decor, broken electrical outlets, room door latch broken and huge gap at bottom of door to hallway. Desk staff cordial enough. Read the reviews carefully- you will see that genuine reviews are 2-3 stars. The fakes touting the "pillow top mattress" and such give 4. Ok if you have low expectations and get a good rate. 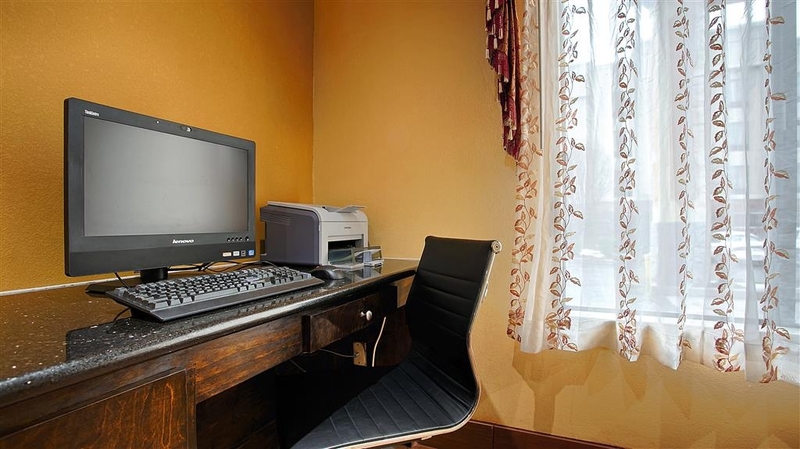 Friendly staff provide a clean and comfortable room in this small town. The beds were comfortable, modern furnishings and a simple breakfast provided. Desk clerk offered suggestions for local dining. Only concern was guests who smoke near the doors; it filters inside hallways. Thank you for taking the time to tell us how we are doing! We appreciate our guests, and thank you for your post. The team members at this hotel seem to really care about their work and it shows in their service. Very relaxed atmosphere, comfortable room/bed, and fresh breakfast. Thank you for such a nice experience while I travelled with my 4-year-old daughter! Terrific! I love hearing how the staff exceeds our guest's expectations! They will be sure to hear about this! We work hard to provide clean, comfortable surroundings, friendly and efficient staff, and all that you expect. We look forward to welcoming you back! Was very surprised at the quality of the room and service. The room was above average. The amenities in the room were very good. The decor was exceptional. I enjoyed my stay very much. The room was queit even though close to the lobby and inner hallway noise was v3ery minimal. This is the half-way point for my mom and I and met in Canton before. This hotel was not horrible, but not fantastic. We chose it because we had a dog with us. I guess my main concern was that the window would not lock and we were on the ground floor. We loved that we could open the window because it was a nice weekend. But it was kind of scary not being able to lock it properly. 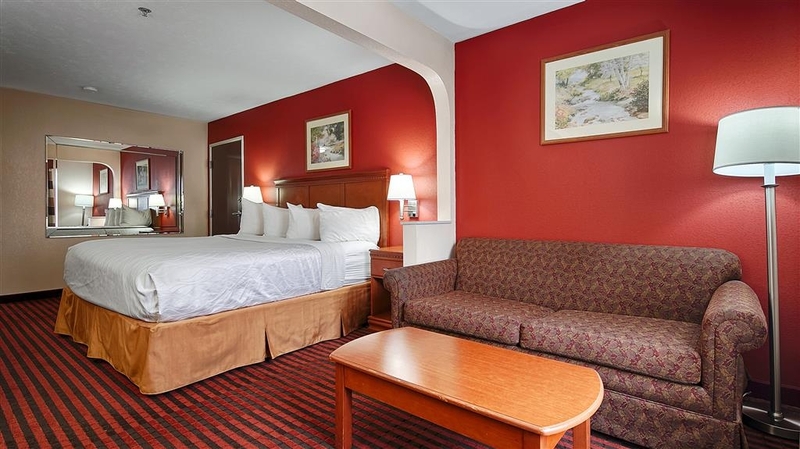 My wife and I stayed at this Best Western in Canton, MS. Let me start off by saying this was such a good value. We received Hampton Inn standards for 20 to 25 dollars less than a Hampton Inn price. The rooms had been recently renovated and all the decor was modern. The breakfast exceeded our expectations. This hotel offers a wide variety of items. The front desk staff was superb. Traveling to support our local high school boys in a state championship tournament. The hotel staff was friendly and accommodating. The rooms were clean and comfortable, and a great location. Our group got up almost past the breakfast time, but the staff made sure we had enough to feed our group. Each staff member was extremely helpful and friendly. Rooms and dining area was clean. Check-in and Check out was simple. There was no elevator though, so we had to use the stairs, but for one night stay it was not a problem for us. Congratulations on winning the State Championship!! Thank you very much for taking the time to publish a review on our hotel to assist other guests in making an informed decision on lodging when visiting the Canton Area. Our staff takes great pride in delivering the level of service our guest expect to receive. 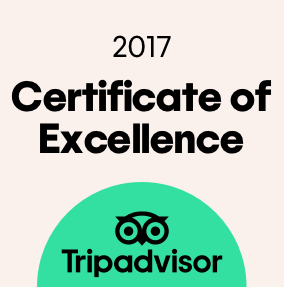 It is our desire to exceed all of our guests highest expectations by providing exemplary service and quality accommodations. Again , thank you for your patronage and choosing our hotel. We look forward to the opportunity of being of service in the very near future. "Not a great place for non-smokers"
This is a great place for smokers but not very good for everyone else. The smoking and non-smoking rooms alternate going down the hallway so there is no way to avoid having some smoke in your room. Our second non-smoking room was tolerable but the first one we were given stank. Also beware of the breakfast hours. They end at 9 am even on the weekends. A plus is that the internet was very good. I am extremely disappointed to read about the experience you had here during your recent stay. As you will see in our past reviews, they reflect the level of pride our staff takes in our level of service and I am very sorry that you did not experience that during your stay. Thank you for taking the time to write a review and notify us of the issues you encountered. Our goal is to provide our guests with positive experiences that they will remember and to establish an ongoing relationship to be your preferred hotel in the Canton area. We arrived a little late which was no problem. Our room looked like it had been recently updated. We had a refrigerator and a microwave along with a mini coffee maker. The bathroom was spacious and had thick towels and a hairdryer. There was a cleverly designed closet behind a large mirror with an iron. Breakfast the next morning was a surprise with the variety of choices. Hot and cold cereal, yogurt, a unique pancake maker, juices, fruit, eggs and coffee. The lobby was being updated as well and Christmas decorations were bring put up. We were impressed with the hotel and service we received. Thank you very much for choosing The Best Western Canton Inn. Our staff strives to provide the level of service our guest expect to receive by providing great customer service and quality accommodations. We are delighted we were able to exceed your highest expectations. We look forward to being of service in the near future. We stayed overnite, the room and furnishings were brand new, and very comfortable. Beds were comfortable, and the room was clean. The staff was friendly, and helpful. The price was reasonable as well. Thank you very much for choosing The Best Western Canton Inn. We very much appreciate your kind comments as it does truly reflect the guest experience at our hotel. Our staff takes pride and care in delivering the level of service our guest expect to receive. They are very passionate in ensuring guest expectations are met. We very much appreciate your loyalty to our hotel and our brand. We look forward to continue to provide you the level of service you expect to receive. Again, thank you very much for choosing our hotel and recognizing our staff. This hotel is the only hotel we will stay when visiting. it offers everything we desire when staying overnights. The staff has always been pleasant, helpful, willing to correct any problems if any. We have made reservations online as well as over the phone. 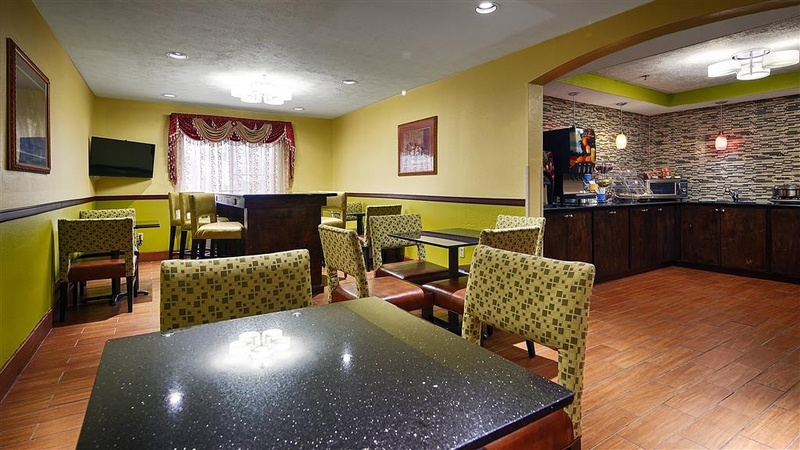 Thank you very much for choosing Best Western Canton Inn and posting a review on TripAdvisor. We are delighted our staff exceeded your expectations in providing wonderful service and quality accommodations. Our entire team of associates take great pride in delivering the level of service our valued guest expect to receive. On behalf of the entire staff, we look forward to the opportunity to be of service in the near future. "Not sure if I can stay there again..."
We stopped here as a midway point on our trip. I got a fantastic rate online. We didn't check in until after midnight. Was surprised to find that we had to climb stairs to 2nd floor...no elevator. Room seemed clean & I was pleased with everything until I jumped in the shower. As I was about to get out of the shower I noticed a dirty washcloth hanging over the shower curtain. The rest of my night was ruined! I kept wondering what else the cleaning staff could have overlooked. Traveling long days from Canada, we were very relieved to enter our room (225) and find it clean, newly decorated and not smelling of smoke. (The hallway is pretty smoky, unfortunately) The king bed was extremely comfortable and we slept extremely well. No noise coming from outside the room. The front desk receptionist was friendly and very helpful in our search for a restaurant. The shower has a large shower head, hot water, shampoo and bath gel on the wall. Breakfast was good. We would stay here again. The price was right for our budget! We stayed at this hotel because we had a pet with us. The room was filthy and there was no elevator to our second floor room. The walls are VERY thin. The couple on one side of us had a very amorous night, and the room on the other side reeked of marijuana and played cartoons all night long. Not the place to stay with a 12-year old girl in tow. "Clean and comfortable king suite!" We were very happy with this hotel. We really enjoyed that the king suite was large with a separate desk and couch. The bed was very comfortable. Breakfast was just fine. The only downfall would be that we could her the TV all night from the room next door. It didn't keep us awake though. After reading several negative reviews was concerned but opted to save money. Was a good choice. Room quite comfortable and clean, breakfast above average. Renovations ongoing so some clutter. Back entrance could be improved. Very good value for rate paid and would stay here again. The price I paid via tripadvisor was so cheap that I was a bit worried. I just needed safe, comfortable and clean for one short night. We read the reviews and decided to give it a try. We pulled in at around 1 AM. Check in was fine. Room was clean and updated. They served the typical American continental breakfast. It's free. I've paid much, much more for a hotel room and received NO free breakfast. We stayed there again just 3 weeks later on our return trip to Florida. Pleased with all service except for some availability problems concerning food for breakfast. They didn't keep the food stocked for the last 30 minutes of breakfast and were unavailable to assist during that time. At most hotels there is a staff person assigned to supervise the room. Onesty I don't love this hotel so much the staff wasn't friendly at least not everyone the room not very clean and the breakfast poor there was not much choices! the only positive thing it was the price so... can be good for just one night! Just had an overnight stop passing through, due to a flat tire and need to find tire repair next morning. I was pleasantly surprised to have found a good spot for a decent price. Hotel is modern, clean and well maintained. Staff was friendly and helpful with locating nearby tire store. Wifi worked well. Breakfast was typical of what you normally find in this price range. Dining area was clean and well stocked. Bed was comfortable. I've had less pleasant experiences with Best Western hotels, but this one was much better than I've seen before. I'd choose this one again if I found myself needing to stop in Canton again.